An event to celebrate Tipperary hurling will be held at the Mansion House in Dublin on 10 April. The rugby and soccer players are getting involved in Tipperary GAA. 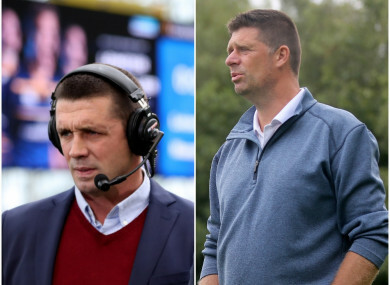 FORMER IRELAND INTERNATIONALS Alan Quinlan and Niall Quinn will both be part of a new commercial board set up by Tipperary GAA to help fundraise for the county’s senior hurling side. Ex-Munster and Ireland rugby player Quinlan is a native of Tipperary town while Quinn, who won 92 caps for the Irish soccer team, has a strong GAA background. He lined out in the 1983 All-Ireland minor hurling final and has a major affinity with Tipperary where his parents originated from. The newly-established commercial board is set to support the ongoing fundraising efforts of the county board and will be chaired by Declan Kelly, the chairman and CEO of the county’s new sponsors Teneo. One of the main tasks of the board is described as ‘a fundraising effort to secure the funds needed to support the ongoing strategic development of the Tipperary senior hurling team under Liam Sheedy’s management’. Sheedy has began a second spell in charge and claimed an opening league success over Clare last Saturday night before they face Limerick this weekend at the Gaelic Grounds. A celebration of Tipperary hurling is set to be organised in the Mansion House in Dublin on 10 April to reflect on the county’s 27 All-Ireland senior hurling title wins and honoured the eight living captains from those successful sides. Email “Former Ireland players Quinlan and Quinn to sit on new commercial board for Tipperary GAA”. Feedback on “Former Ireland players Quinlan and Quinn to sit on new commercial board for Tipperary GAA”.